I can still remember when my name first appeared in a newspaper. It was a big deal. I still get that same sense of awe when I’m mentioned. So, doing the UPDATEs was a natural offshoot. Especially when mentions became frequent and my Treasurer-Tax Collector staff asked me to keep them current, as taxpayers were asking questions about the articles. An even bigger sense of awe occurs when I’m mentioned in a book (see MOORLACH UPDATE — Book Inclusions — October 1, 2015) Obviously, I try to purchase the book. And, I’ve built quite a collection, as I’ve been mentioned in more than 50 of them! More on this in a future UPDATE. As you can guess, the biggest reason for being included in so many books is because of my efforts to warn the County of Orange nearly a quarter-century ago that the incumbent Treasurer-Tax Collector was investing like a financial maniac. The then Orange County Board of Supervisors and County Administrative Officer didn’t understand my message. Consequently, the County filed for Chapter 9 bankruptcy protection, the largest such filing in U.S. history at the time. The date of filing was December 6, 1994. The 23rd anniversary is coming up next week. Over the Thanksgiving weekend, I had an opportunity to purchase a few more books. Let me introduce you to another book mention. 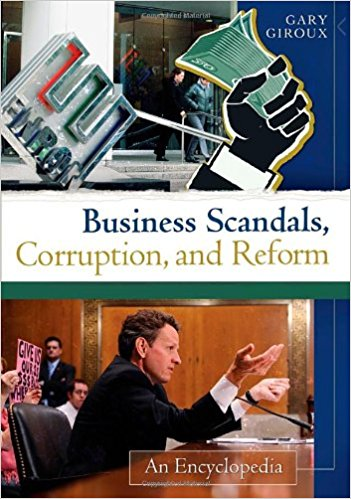 Business Scandals, Corruption, and Reform: An Encyclopedia, Volume Two, M-Z is by Gary Giroux. It was published in 2013, but I just found a somewhat reasonably priced used edition. It’s done in a similar style to Joe Mysak’s Encyclopedia of Municipal Bonds (see MOORLACH UPDATE — Encyclopedia of Municipal Bonds). Volume Two starts with the letter "M." Can you guess the first entry? It’s "Madoff, Bernard L." The "O" section only has two entries: "Off-Balance-Sheet Items" and "Orange County Bankruptcy." Ironically, I believe that "off-balance-sheet items" will be the next municipal debacle. The Government Accounting Standards Board has finally required all of the defined benefit pension plan unfunded actuarial accrued liabilities to be on the balance sheet. It still needs to force unfunded retiree medical liabilities to be reported in full. But, the next shoe to drop will be the inclusion of operating leases on the balance sheet. Stay tuned. Orange County, California, home of Disneyland, declared bankruptcy on December 6, 1994, the biggest local government to file for bankruptcy up to that time, after massive losses of $1.7 billion in complex derivative investments. Merrill Lynch and other investment banks targeted state and local governments for complex derivative agreements. These high-risk instruments seemed poor investments to conservative governments subject to regulatory constraints. Bonuses on high commissions proved too big an incentive to bond salespeople and the banks camouflaged the risks and high costs from the buyers (after being sued, Merrill claimed it warned the Orange County treasurer repeatedly of the risks involved). Government buyers–and ultimate losers–included San Jose, California, the state of West Virginia, Wisconsin Investment Board, San Diego and San Bernardino Counties, and the California Public Employees Retirement System, among others. The biggest loser one was Orange County, which paid Merrill Lynch some $100 million in fees. In addition to unsophisticated municipalities, insurance companies, mutual funds, and hedge funds made similar investments on short-term rates, at the time about 3 percent, while long-term rates were roughly 8 percent. The strategy was to borrow short term and invest long term. The economy was booming, and Federal Reserve (Fed) chairman Alan Greenspan raised the federal funds rate from 3 percent to 3.25 percent in February 1994, the first hike in five years, to fight inflation. The Fed continued to raise rates, up to 5.5 percent by year-end. Other short-term rates followed. Greenspan explained the strategy of a "soft landing" for the economy, but organizations that used complex derivatives speculating on maintaining low risk, and few financial experts predicted the brutal swings in the value of these instruments when short-term rates rose. Democrat Robert Citron, longtime treasurer of Orange County, made big profits on derivative trades using more and more leverage (borrowing up to $13 billion to add to Orange County’s $7 billion investment pool). The strategy was to borrow short term using repurchase agreements and invest in longer-term high yield securities. The complex, high-risk derivatives paid off as long as short-term interest rates stayed low. Included in Orange County’s portfolio were "inverse floater structured notes," with very high interest rates, less some floating rate such as LIBOR (London interbank interest rate). So the structure might be 12 percent interest less the LIBOR rate. A "trigger note" paid a short-term high rate of interest as long as interest rates stayed below a specific cutoff. If interest rates rose above that trigger, the note extended in maturity at what became a low rate of interest, when interest rates were rising (Partnoy 1997, chapter 8). One interesting episode was the last reelection of Citron, in 1994. His opponent was certified public accountant (CPA) John Moorlach, warning about the high risks of Citron’s investment strategy and questioning Citron about investment specifics. He predicted a loss over $1 billion (which proved too conservative). Citron was reelected; apparently, voters were as little concerned about risks as Citron. When interest rates rose in 1994, Orange County’s investments collapsed, losing some $1.7 billion. Unable to roll over its debt, the government declared bankrupt. Citron bought the complex securities mainly from Merrill Lynch (plus smaller investments from Morgan Stanley), probably with little understanding about their risks. Citron pled guilty to filing false and misleading financial statements and other felonies. He received probation. Orange County sued Merrill, and the company ultimately paid $400 million to settle the case. BONUS: Speaking of December 6th, you are cordially invited to our Annual Christmas Open House, from 4:00 p.m. to 6:00 p.m. at 940 South Coast Drive, Costa Mesa, Suite 185. Also see MOORLACH UPDATE — Happy Thanksgiving— November 22, 2017.